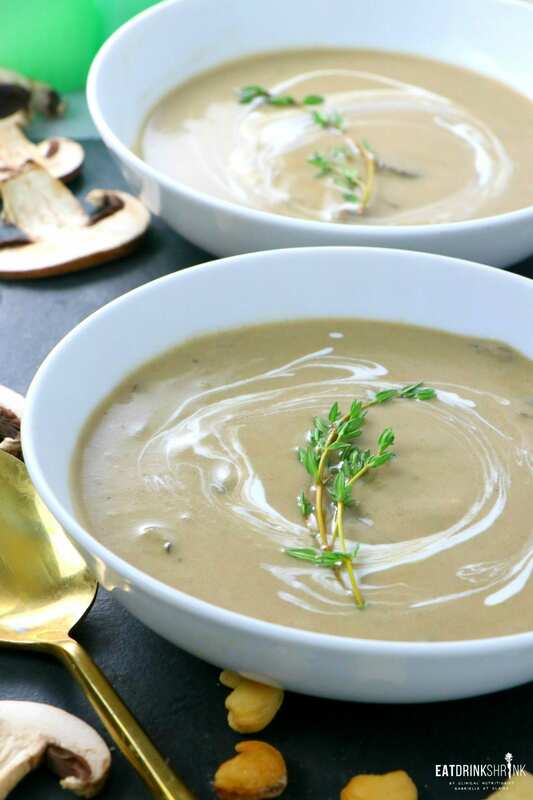 Vegan Cream of Mushroom Soup - Eat. Drink. Shrink. I feel as though this week is already flying by and it’s freezing! The wind alone is horrific lol, which means it’s the perfect time for soup! Soup is one of those concepts I always thought was involved and intricate, but it’s one of the easiest things to throw together and the options are endless! Whenever I make soups, my approach is to pack in as much flavor as possible. When you remove heavy cream, chicken broth you lose flavor, so I always pack it back in with seasonings, roasting veggies, or add body with cashews. If I had to say it, I could eat mushrooms and onions by the buckets. So it’s a no brainer that my two favorite soups are Onion and Mushroom! Ironically my husband doesn’t like mushrooms so I don’t get to make it as often as I’d like (true story). 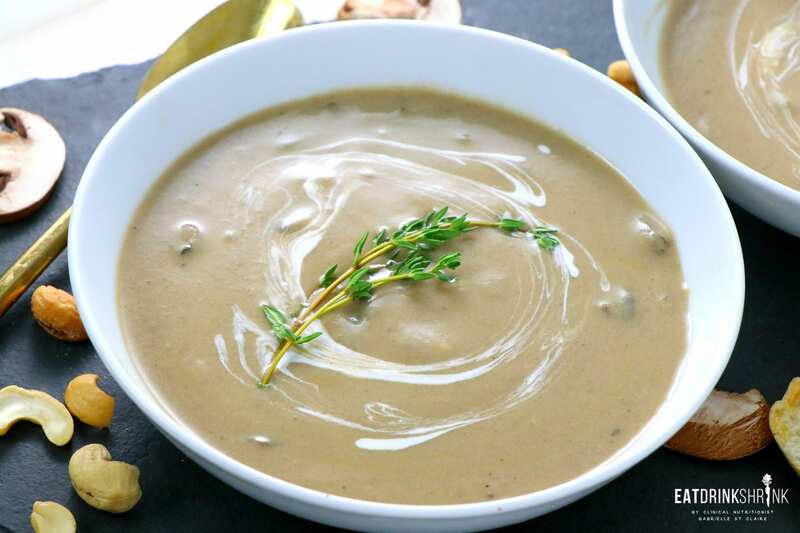 Typically mushroom soup consists of heavy cream and flour. 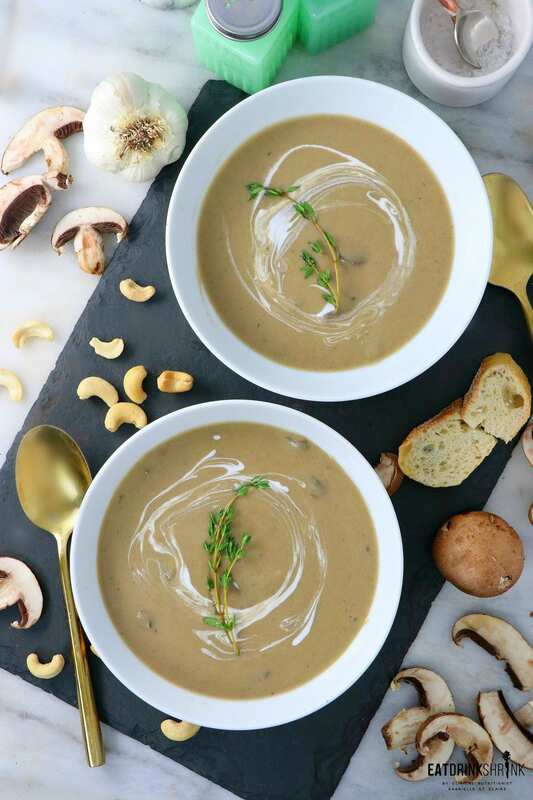 However, this version is flourless, utilizes vegetable broth, and creates a richness with the addition of coconut cream and cashews! It’s rich, creamy, dreamy, and just typing about it makes me crave it! 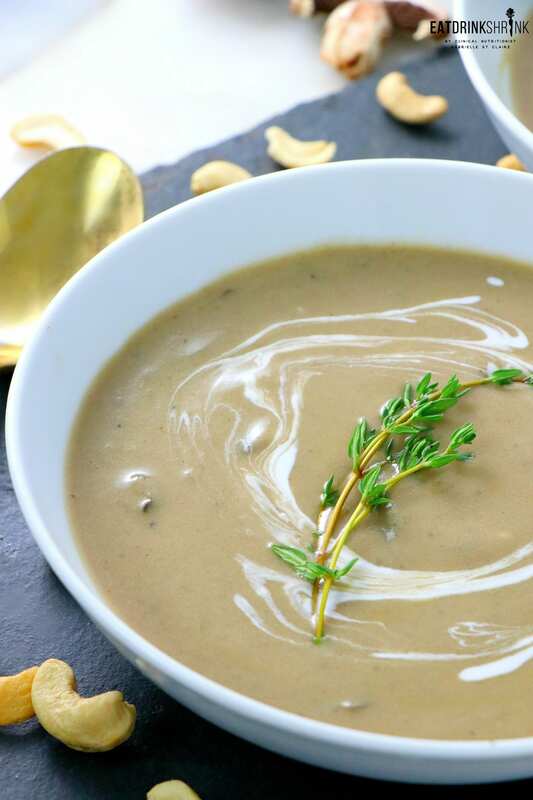 What’s fab about this soup, is everything! 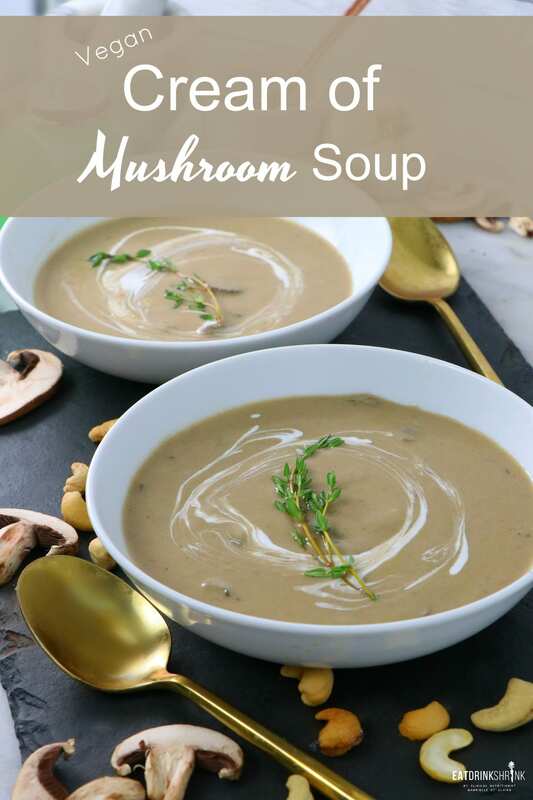 It’s quick, easy, features minimal staple ingredients, packed with healthy fats, mushrooms, rich coconut milk, has texture, can easily be made in bulk, perf for the cold weather, and is hands down one of my favorite soups! 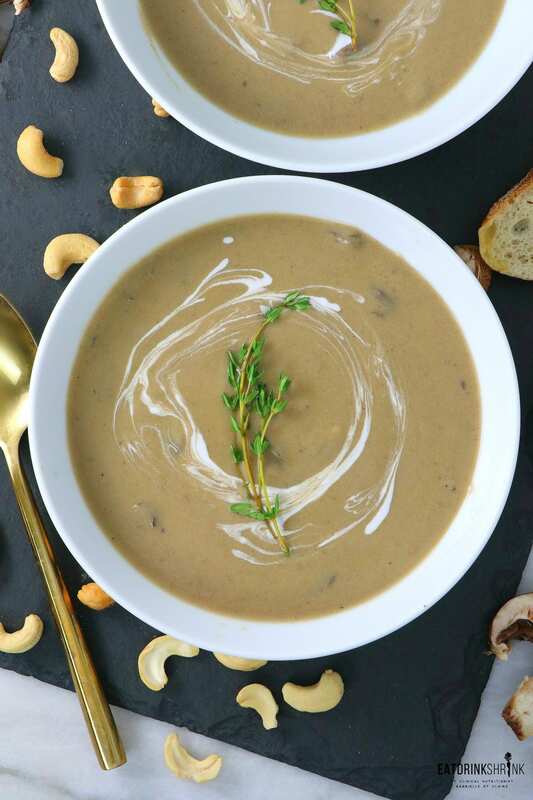 If you love effortless vegan soups or all things mushrooms, you’re going to love my staple vegan Cream of Mushroom Soup with cashew cream! In a large pot heat vegan butter over medium heat and add mushrooms. Sauté for 5 minutes until soft and fragrant. Remove two cups of mushrooms, set aside. Now add the chopped onion and cook for an additional 3-5 minutes. Once the mushrooms have shrunk and begun to release moisture, while the onion starts to brown, reduce heat, add the minced garlic, thyme, and Worcestershire. Saute for an additional 3 minutes. Once most of the of moisture is absorbed, add in white wine and simmer for 5 minutes. Then add in coconut milk, vegetable stock, sea salt, and ground pepper. Stir to combine the soup and then bring to a simmer. Add the soaked cashews to a high power blender and take about a cup or so of the mixture and blend until smooth. Add the remaining soup to the blender in segments and then pour back into the pot. Cook uncovered for at 20 minutes. The soups should reduce slightly and gain a thicker consistency. Toss in the mushrooms you remove earlier to add texture. Garnish with thyme and serve warm.